The avid poster collector, Andrew Hawley, announces his search for 1960's Fillmore Era concert posters. Hawley is seeking posters from Fillmore Era bands including Bob Dylan, Jimi Hendrix, and The Rolling Stones. Fillmore rock posters are more about a period of music verses a particular poster layout or graphic style. 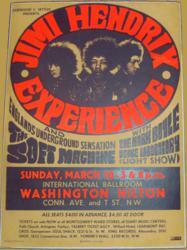 Fillmore Era concert posters represent the heyday of the 1960s rock scene and advertise concerts of the top acts in the 1960s acts such as Bob Dylan, Jimi Hendrix, and The Rolling Stones. Hawley is searching for original 1960s Fillmore Era posters for The Doors, Led Zeppelin, Bob Dylan, Jimi Hendrix, The Who, Janis Joplin, and the Rolling Stones. Hawley pays $3,000 cash for these vintage concert posters. If you happen to have one these relics, please call 310-346-1965 or email Hawley at andrew(at)vintageconcertposterbuyer(dot)com.